Schreiber & Sons started a photography studio in the mid 19th century in Philadelphia, PA. Over the next 30 years, they emerged to be considered among the finest photographers of animals of the time. Ironically, Schreiber's photography actually influenced the work of Thomas Eakins, considered the father of American Realism. Particularly, Eakins painting entitled "Grouse" named after Henry Schreiber's favorite hunting dog was likely copied precisely from a photograph taken by Schreiber. According to Sydney Kirkpatrick, the author of "The Revenge of Thomas Eakins", the photo print of Grouse by Schreiber appeared as the frontispiece in an 1873 issue of the Philadelphia Photographer. Both the photo print and the painting were virtual mirror images [page 168, The Revenge of Thomas Eakins]. Eakins' relationship with the Schreibers is well documented. In addition to the painting of Grouse, Eakins included the Schreibers in a few of his Schuylkill River skull scenes (see below). Like all photographers of their time, Henry Schreiber and his brothers worked with the albumen process for developing and printing their photographs. Because there was no standard, photographers at this time often held their process as secret. Schreiber, like a handful of leading photographers of their time worked hard to capture movement and composition that transcended standard portraiture. Much of this focus was devoted to the photography of all kinds of animals. 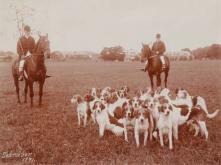 During this time, many important dogs, horses and cattle were prominently photographed for their owners. In these circumstances, Henry Schreiber was the preferred photographer. We currently hold several photographs buy Schreiber and Sons. Many are signed and some have information on verso regarding the lineage, title and names of animals photographed for their owners. They are most striking when seen as a collection. Enjoy your viewing of a recognized photography legacy here in the Philadelphia area.